Wind is the motion of air in the atmosphere. Movement means that the air has macroscopic kinetic energy (in addition to the microscopic thermal energy that comes from the air being at a particular temperature), which can be harnessed by a wind turbine and turned into electricity. This is often referred to as wind power and wind is therefore considered as an energy flow. This is often considered a form of naturally occurring convection. Generally, movement in the horizontal direction is much stronger than in the vertical direction. However, both the vertical and horizontal components of wind have a significant impact on weather. Rising air cools and condenses to form clouds and sinking air warms and dissipates cloud cover. Wind is generally described in terms of horizontal speed and direction. Wind speed can be measured by an anemometer and wind direction by a weather vane. The force of friction and the Coriolis Effect both influence wind direction and speed. The process of wind formation from uneven heating of the Earth's surface. Wind is formed due to uneven heating of the Earth’s surface. These surfaces absorb heat at different rates; for example sand on a beach can be too hot to walk on while nearby grass feels cool. As these surfaces absorb heat at different rates, the air just above the surface warms and begins to rise. The rising hot air creates a change in pressure in the area. Air naturally moves from the areas of high pressure to low pressure, which causes the horizontal movement of air. A practical example is the ocean breeze. The air above land warms faster than air over water. As the hot air over land rises, the cool air over the ocean rushes in to fill the space. The result is a cool ocean breeze. Friction is the force generated from the resistance between two surfaces. Friction acts opposite the direction of motion and slows down relative movement. This means that friction could cause objects to speed up, but the two surfaces are moving less with respect to each other. For example, the brakes in a car use friction to stop the vehicle, or friction lets the tires push the cars forward. The same principle applies to wind: wind is the movement of air molecules and these molecules are subject to the same force of friction that stops moving vehicles. Impacts of friction on air movement decrease as the altitude increases, typically 1-2 km where there is no effect. Around the 1 km mark, friction plays a critical role in wind movement. This 1 km layer is referred to as the boundary layer. Contact between smooth surfaces result in lower frictional forces than between rougher surfaces. Near the surface of the Earth there a many things that interfere with wind, causing it to slow down and change its direction. These factors include trees, mountains, buildings and even lakes. The effect of friction is only important near the surface of the Earth. The higher one travels into the atmosphere, the less obvious are the effects of friction. For this reason, frictional force is low over the ocean and high in the atmosphere. Wind speeds are usually higher in these areas because of the lack of frictional force. Friction acts to slow down wind and changes its direction, which results in a chaotic air flow called turbulence. Friction is also what causes wind turbines to spin. The wind hitting the turbine blade results in some of its momentum being transferred to the blade, causing it to rotate. Figure 2. The Coriolis Effect on Earth, more noticeable towards the equator due to higher speed of rotation at that latitude. 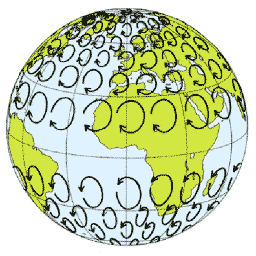 The Coriolis Effect is the apparent deflection in the path of the wind due to the Earth’s rotation. Note that the Coriolis Effect is only an apparent deflection; the path of the wind does not change. The deflection is seen on Earth because observers on the Earth’s surface are rotating with the Earth and are not able to observe the wind from a stationary point. The Coriolis Effect is an important force to consider for global weather patterns. The Coriolis Effect causes wind to appear to deflect to the right in the Northern Hemisphere and to the left in the southern hemisphere. Over short distances, the Coriolis Effect causes a deflection that is too small to be noticable.